Modern “Responsive” design enables online access anywhere in the world using any screen. Find the data sets you want quickly then apply our tools to get the insights you need. Offer Telematics Services to your customers and teams, anywhere in the world at any time. Instead of worrying about developing your own portal, you can instead use ours to deliver Telematics Services. All the functionality you need plus a few customization options, so you can quickly deliver a branded user experience to anyone you want. The Data Portal is entirely online and 100% driven by our API. This means you can provide instant access to anyone, anywhere, at any time. Plus you never have to worry about outdated software, since the portal is accessed essentially like any other website. Use our powerful data tools to quickly find the data set(s) you want, then visualize or tabulate this data as you prefer. Expressing millions of raw data points into a single value, takes only milliseconds thanks to our sophisticated data aggregation algorithms. 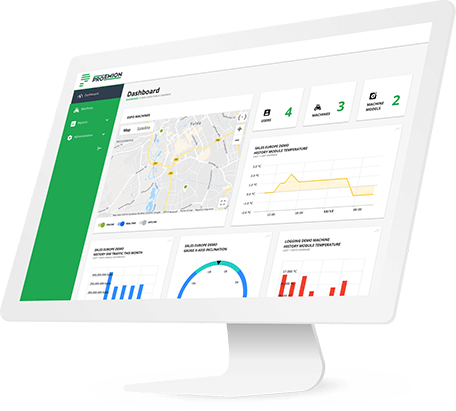 The Data Portal lets you quickly deliver a consistent and high quality user experience, without the hassle of creating your own portal to provide Telematics Services. We have everything you need to get setup, along with a few customization options to apply your unique brand and preferred color schemes. This is simply the fastest way to get a 100% functional portal with the least effort. Your fleet data is the most valuable asset you possess – from improving performance, to enhancing customer experience, to adding new revenue channels. Therefore you need a Data Visualization and Analysis tool that helps you accomplish your goals quickly, and with minimal fuss. Setup your portal and dashboards so you always have access to the data most important to you. Machine Telematics Data is automatically updated in near real-time. You don't need to do a thing! Situations, demands, and environments change over time – so the portal lets you adapt quickly. Make decisions and adjustments based on actionable data, clearly and accurately presented in the most convenient format. You can discover new insights based on all your accumulated historical data, or react to emerging trends based on most your most recent data. Your fleet data to tell you everything you need to know to make an informed decision. Therefore in our next release, you will have a Data Tool that tells you when you need to get involved, and can automatically enforce appropriate usage and safety policies without human intervention. Add your own KPIs, thresholds, and scenario models; then create triggers to alert you instantly. Once you setup triggers, you will be automatically alerted once all the requirements are met. You can always adjust and/or improve your models based on more data, new insights, and trends. Once a trigger is activated, the reaction is automatic and near-instantaneous. You can setup scenarios in the Data Portal to react on your behalf (e.g. to enforce geo-fences or warn of improper usage) or alert end-users / internal teams that a human response is required. In addition to the Data Portal, you also gain access to the Admin Portal. A dedicated administration tool kept separate from the data consumption tool, so you can manage user access and permissions more securely. Both portals work together seamlessly, but only the Admin Portal can affect changes in the Data Portal (like granting or revoking permissions). Just because you are collecting billions of data points in near real-time, does not mean users need to see every single data point on their screen. This would seriously compromise your service performance, and most of this data would not tell you anything useful anyway – at least until you get it normalized and aggregated! Our data tools help you find the data set(s) you want quickly, and our data aggregation algorithms will combine and express millions of data points into a single (more useful) value in milliseconds. Since you can aggregate data on-the-fly so quickly via the Data Portal, it becomes a simple matter to dive deeper into your data to find exactly the insights and trends you need to make decisions. There is no need to wait for every little single little adjustment. You will get your answer in seconds! This level of Big Data Performance is all thanks to our world-class Data Center and Cloud Services. You will never be lacking for computational power or data bandwidth. Your customers can run multiple complex aggregations and data searches without compromising their service performance. The Data Portal offers a wide range of visualization & reporting options, so you can ensure that every user gets exactly the data they want on their screen, in the format they prefer. You are also never stuck with just one setup or arrangement, and can always adjust to future business needs, performance trends, and customer expectations. All machine data can be visualized or tabulated using Drag-and-Drop widgets. If there is any data missing from your dashboard, simply create a new widget and select the signal, aggregation, time series, and business object(s) you want. Once you have the reports you want setup in the Data Portal, the system will keep everything updated with the latest available information. In cases where units are out of range, data will be transferred upon reconnection. It is impossible for a Data Portal user to “hurt” the system in any way. Users can only consume data using the portal, and can therefore be given complete freedom to manipulate data in order to identify and measure trends. You can view performance, status, and usage data from every machine you ever manufacture, down to single machines and individual sensors. This includes all data collected from the first moment of connection and up to the current instant. Data sets can be readily created, modified, grouped, and aggregated on-the-fly according to precise need – regardless of how many data points are included. The Data Portal offers one screen to rule, manage, and monitor your entire fleet. You can also easily limit users to exactly the data they need (such as a single machine or fleet), and give them all the tools they need to find useful data and insights. Machines are instantly registered in the system as soon as their CANlink unit is activated and connected. This allows you to monitor the usage and performance of every machine you ever make at all times. All registered machines can be managed via the Data Portal. You can manage your entire fleet from one screen, and enable permissions so end-users so they can manage their own machines and/or fleets. Not only can you pull data from any machine or sensor at any time, you can also PUSH data to any machine at any time. This enables you to update, upgrade, query, and service any connected machine at any time using only the Data Portal. 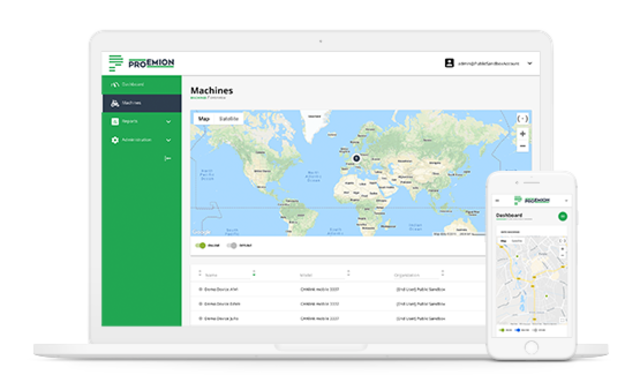 The Data Portal can be used as a global fleet management tool connecting millions of machines, or as a simple performance monitoring solution for machine operators. This is made possible by our dedicated Admin Portal, which enables secure user administration at any organizational level. The Data Portal provides your customers and internal teams with instant access to their machine data – all they need is a link to the Data Portal and a user account assigned by an administrator. User accounts and permissions can be managed by the Admin Portal to ensure appropriate access is granted. Accounts can also be assigned to individual users based on their CANlink unit ID number. All data collected by Proemion CANlink units will become available for consumption and analysis almost instantly. Furthermore, all collected data will be stored in the cloud of your choosing indefinitely (note: Proemion provides cloud services for data storage via our Data Platform solution). You can update, patch, and upgrade your machine’s software and firmware completely wirelessly (OTA). This also includes the ability to flash your machine’s firmware should that step be needed. Machines which are outside communication range will be updated as soon as a connection is reestablished. You can also OTA update using WiFi or Bluetooth if that is more convenient. If you are limited to Bluetooth or WiFi only, or otherwise prefer not to use Mobile Data, ask about our Local Connectivity solution. The look of the Data Portal can be easily reskinned to include your logo and brand colors. Further customization of the user interface is also possible, based on a defined scope and agreement. This can be part of our initial agreement to design and build a Proemion-based Telematics Solution, or included at any later stage based on your changing needs and requirements. Any device with internet capability and active connection can be used to access the Data Portal. The Data Portal is designed to work on any screen, and will adapt to the native resolution of the device being used. Note: it is also possible to access Telematics Data without using an internet connection or the Data Portal. Ask about our Local Connectivity solution. There is absolutely no need to develop or use a Mobile App to provide access to Telematics Data. Since the Data Portal is deployed via the web and uses a Responsive design, all you need is a valid URL (and user account) to access your Telematics Data. Just add the link to your mobile homescreen and you are all set. You still have the option to use a Mobile App if you so wish. You only need to use our REST API to integrate any data functions and capabilities you want to include in your Mobile App. The Data Portal can be deployed anywhere, to anyone, at any time - there is no user limit. All you need is a registered user account and valid URL, and you can access the Data Portal using any internet-connected device. This means you can deliver Telematics Service to all your customers and internal teams, whenever you want and at a moment’s notice. User accounts only need to be registered in the Admin Portal and then provided with the appropriate service URL. You can offer your customers unlimited premade dashboards for their convenience. 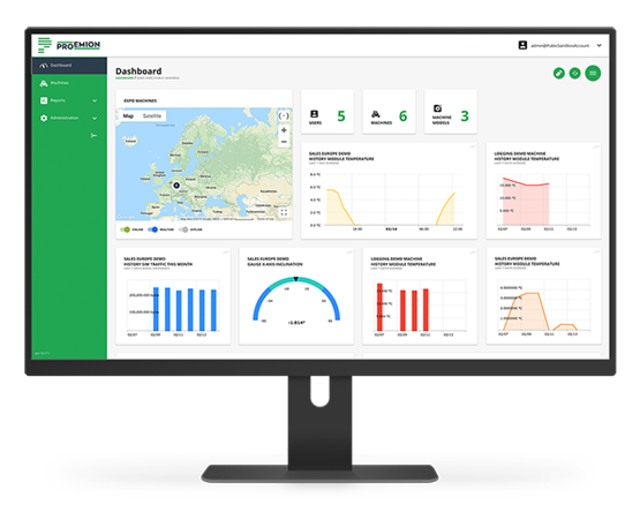 You can also enable your customers to create and save their own dashboards – or offer a hybrid solution. The dashboard is widget-based, which can be customized to display and report data in any manner which you preferable. The widgets are also drag-and-drop, so the arrangement can always be customized to individual preferences. We offer end-to-end security over our entire Telematics Solution. Strict Data Privacy policies. For example we only use customer data to provide services. Anonymous machine data may be used to improve services and performance, but only with your authorization. Database Security. For example all your data is hosted in a private database. 100% Data Ownership. We will not delete data in your account without giving you time to export it. Our security features can also be made to work with, or around, your own security policies. Further details are defined and covered in the Service Level Agreement (SLA). We take full advantage of everything the Cloud has to offer to a Big Data solution such as ours. You will never have to worry about data storage, processing power, or data delivery by using our Data Platform and Data Center services. Your feedback is crucial for helping us improve our technology, capabilities, and services. This is why we prefer to work closely with our clients at all stages of engagement. There is simply no better source for figuring out where to improve and what to build next. We are actively improving the Data Portal on a continuous basis, which is again why your feedback is so important to us. One of the key activities we are focusing on is adding more customization options for developers and non-technical operators – as well as more personalization options for end-users. 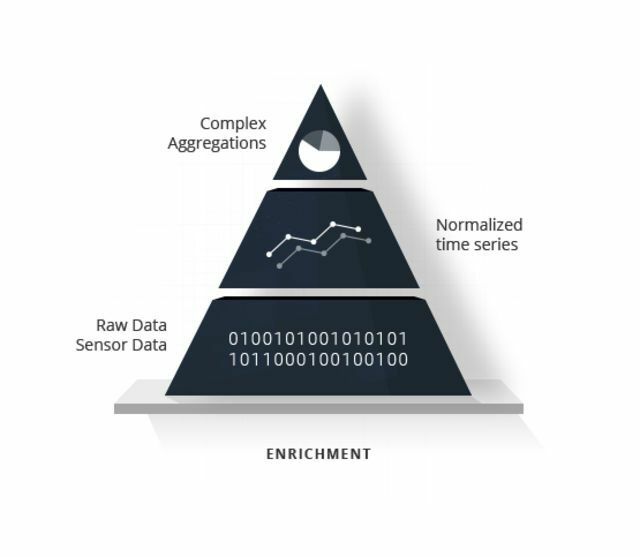 Big Data is already the reality of any good Telematics Solution. While we already offer a plethora of tools and great data performance, we are never satisfied with the status quo. This means we are still (and will always be) working on improving service performance, and increasingly sophisticated data algorithms. Accurately determining the status of your machines is crucial for the efficient and productive performance of your machines and vehicles. Accordingly we are continuously working on improving the detection of anomalous data, in order to more accurately represent the true status of every machine. This is a feature that naturally gets better over time, as we gather more and more data from machines operating in very diverse conditions. This is also why we actively make sure to account for and adjust to new anomalous events and conditions, so they do not affect the operating status of your machines. True Artificial Intelligence (AI) is a massive field in its own right with some astounding potential. We are focusing more actively on Machine Intelligence, which is a subset and specific use case of Artificial Intelligence. Our essential goal is to create a platform that will enable and power Machine Learning and Machine Intelligence for our clients. This means machines that can perceive their environment, and take actions that maximize the chances of success in a specified goal – specifically by “learning” and “solving problems” encountered in new and unique environments. Be sure to sign up for our Newsletter to stay informed about continuing developments in our Machine Learning and Machine Intelligence efforts. These are the natural result of Predictive Analytics and the Continuous 2-way Global Communication we already offer through our service. We are already working closely with our partners to make Predictive Analytics a commercially viable reality. Once available – you will be able to predict potential issues in your fleet, and then automatically alert operators or monitors so they can be addressed before they have a chance to cause problems. You will also be able to proactively or reactively enforce safety policies in a matter of seconds. Such enforcements will always be based on received data, plus your own scenario models, safety policies, and specified data thresholds. For example applying emergency brakes, shutting down or disabling the engine, and disabling entry or exit from the vehicle in an anomalous situation. These will also enable organizations to finally implement Predictive Maintenance (Pdm) in their servicing and after-sales plans. Be sure to sign up for our Newsletter to stay informed about our developments in Predictive Analytics and Predictive Maintenance. This is our ultimate goal – unleashing the Internet-of-Machines! Combining all the benefits and capabilities of the Internet-of-Things networking (IoT), Machine-to-Machine (M2M) communications, Global Telematics Connectivity, and Big Data Services. Make sure you sign up for our Newsletter to keep informed about continuing developments in the IoM.